I arrived at Vancouver nine hours and a half after I left Narita airport. I was so tired with the long flight. But the weather was too fine to be staying in the hotel room. 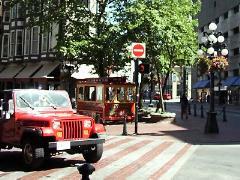 I went to the Vancouver main street. The street was crowded by travelers. 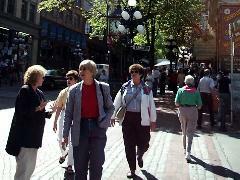 My guide book says that this is the place where the prosperity of Vancouver began. 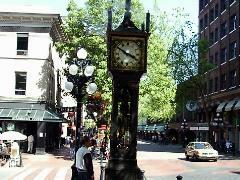 When I went to the Gas Town, I saw an interesting clock. This is the clock that runs by vapor. When I was strolling here and there, I became aware that the travelers gathered around the steam clock bringing their cameras. They were preparing to take photo. 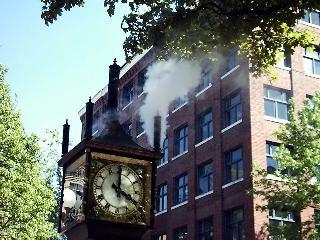 Then suddenly the clock started generating a lot of steam and made sound like chime. It was so interesting scenery. I had a hamburger and mushroom at a small restaurant because I had heard that mushroom in Canada is so delicious. Mushrooms were fried and flavored with a little salt. They were so delicious. I went to Victoria the next day.